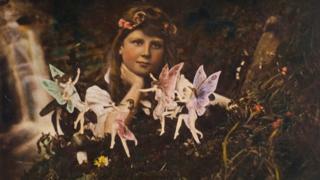 A series of the famous faked Cottingley Fairies photographs are due to be sold at auction. Auctioneers estimate the 13 lots could fetch about £65,000 later this month. Chris Albury, auctioneer and photography specialist at Dominic Winter, said: "These photographs come to us so infrequently, there are far fewer than one would have guessed." Two of the photographs were sold at Dominic Winter for more than £20,000 in October. Mr Albury said some of the latest batch of photographs up for sale had come from the daughter of Frances Griffiths. Frances and the Fairy Ring, a print from the original negative, was "the most important single photograph" and "as close as you can get" to the events in Cottingley, he said. The collection also includes four hand-coloured pictures that Mr Albury had "never seen before". The girls borrowed Elsie's father's camera, and used coloured paper cut-outs and hat pins to stage their scenes near the stream at the end of Elsie's garden. In 1919, Elsie's mother, Polly Wright, took prints of two photographs to show members of the Theosophical Society in Bradford. Leading society member Edward Gardner, used photography expert Harold Snelling to produce photographic prints of them to be sold at Gardner's theosophical lectures in 1920. The pictures then found their way to keen spiritualist Conan Doyle who was writing a magazine story on fairy life, sparking great public controversy when it was published. The photographs are to be sold by Dominic Winter Auctioneers in Cirencester, Gloucestershire on 11 April.